Phaer is a farming village located in southern Auridon, over the hills of Iluvamir, northwest of Silsailen and south of Mathiisen. Phaer is an unwalled town built at the feet of the white granite mountains in the Auridon's middle. Vast flooded terraced fields of saltrice and other crops, as well as pastures extends to the south of the settlement. It is unknown when Phaer was exactly founded, but its oldest foundations dates to the early First Era, when Kinlady Fiorallelle commanded the construction of the halls of Ondil under modern Phaer. However, these Aldmeri-style ruins were abandoned before they were ended. Phaer sprang as a mining village beside the abandoned halls of Ondil. From the depths of its mine, Altmer extracted porphyry ore, however, the source of the mineral was worked-out by the Second Era. From that moment, its economy shift towards agriculture and husbandry. 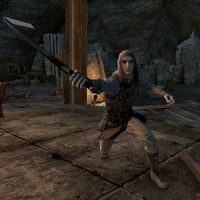 Their fields turned to be so productive that local Altmer peasants were insufficient and Bosmer and Khajiit immigrants began to arrive to the village to work on the fields, specially after the First Aldmeri Dominion was founded. Some time before 2E 582, the Maormer Aluvus became infected by a vampire and sought refuge within the abandoned halls of Ondil under Phaer. First, he began to roam the village, trying to choose a victim. In time, he finally decided to satiate his hunger on the kindest Altmer of the village, the alchemist's son, Tancano. Soon, Hendil discovered his son had already infected other villagers and turned the ancient mine into a quarantine, first using salloweed aloe to sedate both his son and the afflicted and, then, began to bring sane villagers to saciate his son's thirst for blood. He and his assistant, Amuur, made up the story about the plague. Then, he hired a mercenary company to guard both the village and the mine to keep the villagers and outlanders from knowing the truth. Some of the Altmer residents of Phaer first thought the plague was brought upon them by Bosmer and Khajiit immigrants who work on its fields. Many of those workers were the first to be infected and wandered the fields turned into bloodfiends. Others thought it was a divine punishment against the village. Finally, the Soulless One, with help from Velatosse uncovered the false plague. He enter the quarantine and slain Amuur and Tancano, and arrested Hendil, whose fate beyond that moment remained unknown. Aluvus, the plague's bringer to Phaer, was also slain by the Soulless One within the depths of Ondil, ending the vampiric menace. Following the false plague of Phaer, people from around Auridon still thought for a while that an actual plague hit the village and restricted the entry of their inhabitants to other settlements. Around the same time, Soulfire Plateau, main Phaer's Altmer Temple to the Ancestors was desecrated by necromancers, who began to kidnap people from the roads and even killed and raised a whole unit of First Auridon Marines. The necromancers were put down by the Soulless One and the holy grounds returned to peace. Phaer has always been an integral part of the realm of the Summerset Isles since its foundation. However, neither a canonreeve nor a kinlord or kinlady is tasked to rule the settlement. It appears to be a peasant village, with some local leaders, even of noble descent, but without official titles. 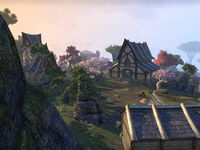 Phaer's fields are very productive and needs of extensive labor from both native Altmer and from immigrant manpower, mostly Bosmer and Khajiit, who poorly live in huts out in the fields. So, Phaer's crops and livestock are heavily valued and guarded. 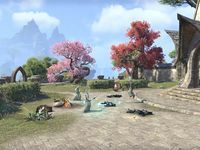 The Soulfire Plateau serves Phaer as collective mausoleum, where local Altmer go to honor their ancestors and to store the ashes of their deceased. 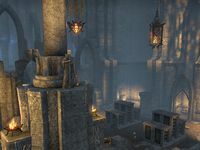 The ancient porphyry mine was reconverted into a burial site for those foreign workers the Altmer bring in to do their menial labor in the fields around Phaer, because Bosmer and Khajiit do not cremate their dead.